The Statue of Liberty was a gift from the French for America’s centennial in 1876 to celebrate the French ideals of the republic; the friendship between the countries and the American democracy. France provided arms, ships, money and men to help America win independence from Britain. The French designed the Statue and the United States provided the pedestal and the site. The French financed the statue by public fees, a lottery and entertainment. But as the price for the pedestal soared funds ran out half way through. In 1885 Joseph Pulitzer and his newspaper The World raised the rest in a six month campaign. $102,000 was given by over 120,000 donors (the equivalent of $2.3 million) was donated in 5 months – much of it came in amounts of one dollar or less. Fundraising activities included prize fights, art exhibitions and theatre. There was a celebrated donation of a poem by Emma Lazurus “The New Colossus” written in 1883 and which appears in bronze on the pedestal. The sonnet was auctioned for the fund. Pulitzer also publicised the stores which sold statuettes at no profit at $1 (6 inches high) or $5 dollars (12 inches high). 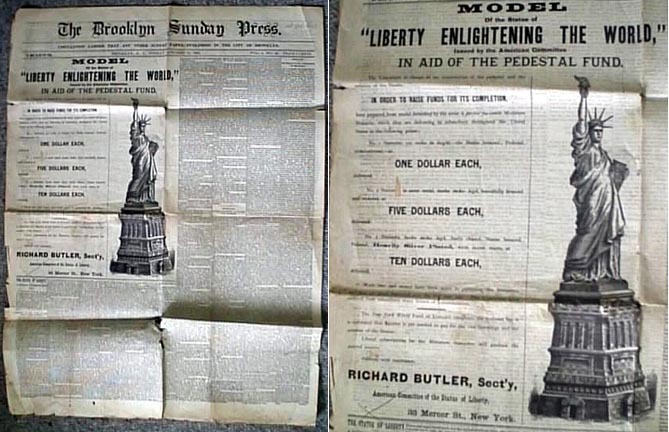 These were sold on behalf of the American Committee of the Statue of Liberty. Pre-launch pledges are important for any campaign. If you can get 20% immediately this gives great impetus for other donations as people like to back a winner. Not just social media but websites, blog, TV, radio and newspapers. Publicity will help gather in donations but also publicise your cause or business. If you appeal to children – they can bring in the parents. Use standard fundraisers such as raffles, meetings, community events etc. These will help build your community and encourage people to spread the word as well as increase donations. The most popular statue was the one for $1. They did produce a bigger statue as a gaslight but this did not sell as well. If you are crowdfunding an invention or innovation protect your IP or be willing to open the idea to the crowd. Hope your future visitors benefit out of it as much as I did. Thank you for your time and take care. Thank you for letting me know. And I’ve added your link to the post.